New Carver adjustable bimini support poles. Great for moving your bimini out of the way when not being used. Carver Bimini Top Storage Boot - Black 91"- 96"
Carver Bimini Top Storage Boot. Black 91"- 96". Size is based on the width at the deck hinge mounting points. Constructed of 7 oz. 2 Bow Bimini Top with Gray Double Duck Poly Cotton Cover. Double-walled main bow for added strength and durability. Fits Widths:63" - 73". Fits boat widths: 63" - 73". Overall top length: 66". Overall top height: 42". 4 Bow Bimini Top with White Vinyl Cover. Fits Widths:96" - 102". Fits boat widths: 96" - 102". Overall top length: 96". 1" heavy wall anodized square aluminum tubing. Square aluminum tubing brace kit for rear supports. 3 Bow Bimini Top with White Vinyl Cover. Fits boat widths: 73" - 78". Double-walled main bow for added strength and durability. Fits Widths:73" - 78". 7/8" heavy wall anodized round aluminum tubing. Overall top length: 60". 3 Bow Bimini Top with White Vinyl Cover. Double-walled main bow for added strength and durability. Fits boat widths: 61" - 66". Fits Widths:61" - 66". Overall top length: 72". 7/8" heavy wall anodized round aluminum tubing. 3 Bow Bimini Top with White Vinyl Cover. Double-walled main bow for added strength and durability. Fits boat widths: 91" - 96". Fits Widths:91" - 96". Overall top height: 54". Overall top length: 72". Carver Bimini Top Storage Boot - Black 79"- 84"
Carver Bimini Top Storage Boot. Black 79"- 84". Constructed of 7 oz. 100% acrylic marine-grade binding. 5 out of 5 stars - Carver Bimini Top Storage Boot - Black 79"- 84"
3 product ratings3 product ratings - Carver Bimini Top Storage Boot - Black 79"- 84"
2 Bow Bimini Top with White Vinyl Cover. Double-walled main bow for added strength and durability. Fits Widths:63" - 73". Fits boat widths: 63" - 73". Overall top length: 66". Overall top height: 42". 4 Bow Bimini Top with White Vinyl Cover. Double-walled main bow for added strength and durability. Fits boat widths: 91" - 96". Fits Widths:91" - 96". Overall top length: 96". 7/8" heavy wall anodized round aluminum tubing. 3 Bow Bimini Top with Captain Navy Sunbrella Acrylic Cover. Double-walled main bow for added strength and durability. Fits boat widths: 79" - 84". Fits Widths:79" - 84". Top Height:36" - 46". Overall top length: 72". 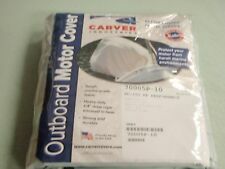 Carver Industries 2 Bow Bimini White Vinyl V4257U. Normalized SKU: V4257U. 2 Bow Bimini Top with White Vinyl Cover. Double-walled main bow for added strength and durability. Fits boat widths: 53" - 62". Fits Widths:53" - 62". Overall top length: 66". Overall top height: 42". 4 Bow Bimini Top with Jockey Red Sunbrella Acrylic Cover. Fits Widths:96" - 102". Fits boat widths: 96" - 102". Overall top length: 108". 1" heavy wall anodized square aluminum tubing. Square aluminum tubing brace kit for rear supports. 4 Bow Bimini Top with Pacific Blue Sunbrella Acrylic Cover. Double-walled main bow for added strength and durability. Fits boat widths: 79" - 84". Fits Widths:79" - 84". Overall top height: 54". Overall top length: 96". 3 Bow Bimini Top with Burgundy Sunbrella Acrylic Cover. Double-walled main bow for added strength and durability. Fits boat widths: 67" - 72". Overall top height: 54". Fits Widths:67" - 72". Overall top length: 72". 4 Bow Bimini Top with White Vinyl Cover. Fits boat widths: 91" - 96". Fits Widths:91" - 96". Overall top length: 120". 1" heavy wall anodized square aluminum tubing. Square aluminum tubing brace kit for front and rear supports. 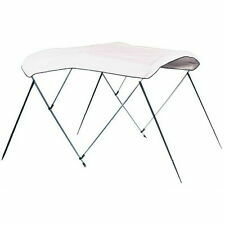 3 Bow Bimini Top with Toast Sunbrella Acrylic Cover. Double-walled main bow for added strength and durability. Fits boat widths: 61" - 66". Fits Widths:61" - 66". Overall top height: 54". Overall top length: 72". 3 Bow Bimini Top with Cadet Gray Sunbrella Acrylic Cover. Double-walled main bow for added strength and durability. Overall top height: 54". Fits boat widths: 85" - 90". Overall top length: 72". 7/8" heavy wall anodized round aluminum tubing. 4 Bow Bimini Top with Persian Green Sunbrella Acrylic Cover. Fits Widths:96" - 102". Fits boat widths: 96" - 102". Overall top length: 108". 1" heavy wall anodized square aluminum tubing. Square aluminum tubing brace kit for rear supports. 4 Bow Bimini Top with Burgundy Sunbrella Acrylic Cover. Fits Widths:96" - 102". Fits boat widths: 96" - 102". Overall top length: 96". 1" heavy wall anodized square aluminum tubing. Square aluminum tubing brace kit for rear supports. 4 Bow Bimini Top with Pacific Blue Sunbrella Acrylic Cover. Fits Widths:96" - 102". Fits boat widths: 96" - 102". Overall top length: 96". 1" heavy wall anodized square aluminum tubing. Square aluminum tubing brace kit for rear supports. 2 Bow Bimini Top with White Vinyl Cover. Double-walled main bow for added strength and durability. Fits boat widths: 74" - 84". Fits Widths:74" - 84". Overall top length: 66". Overall top height: 42". 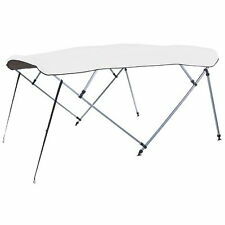 4 Bow Bimini Top with Linen Sunbrella Acrylic Cover. Fits boat widths: 91" - 96". Fits Widths:91" - 96". Overall top length: 120". 1" heavy wall anodized square aluminum tubing. Square aluminum tubing brace kit for front and rear supports. 4 Bow Bimini Top with Captain Navy Sunbrella Acrylic Cover. 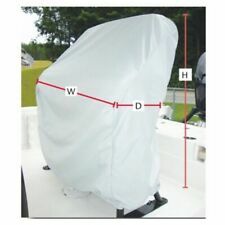 Cover & storage boot have a cutout for a bimini top mounted running light. Fits Widths:96" - 102". Fits boat widths: 96" - 102". Overall top length: 96". 4 Bow Bimini Top with Cadet Gray Sunbrella Acrylic Cover. Cover & storage boot have a cutout for a bimini top mounted running light. Fits Widths:96" - 102". Fits boat widths: 96" - 102". Overall top length: 96". 4 Bow Bimini Top with Persian Green Sunbrella Acrylic Cover. Fits Widths:96" - 102". Fits boat widths: 96" - 102". Overall top length: 96". 1" heavy wall anodized square aluminum tubing. Square aluminum tubing brace kit for rear supports. 4 Bow Bimini Top with Pacific Blue Sunbrella Acrylic Cover. Cover has a cutout for a bimini top mounted running light. Fits Widths:96" - 102". Fits boat widths: 96" - 102". Zippered bow sleeves for easy removal of cover to make cleaning simple and efficient. 4 Bow Bimini Top with Haze Gray Performance Poly-Guard Cover. Fits Widths:96" - 102". Fits boat widths: 96" - 102". Overall top length: 96". 1" heavy wall anodized square aluminum tubing. Square aluminum tubing brace kit for rear supports. Carver 55603 7/8" Bimini Top Frame, 73"-78"
7/8" Aluminum Round Tube/ Nylon Fittings. Fits pleasure boats as well as fishing boats. NEW IN BOX. 3 Bow Bimini Top with Caribbean Blue Performance Poly-Guard Cover. Double-walled main bow for added strength and durability. Fits boat widths: 61" - 66". Fits Widths:61" - 66". Overall top height: 54". 3 Bow Bimini Top with Haze Gray Performance Poly-Guard Cover. Double-walled main bow for added strength and durability. Overall top height: 54". Fits boat widths: 85" - 90". Overall top length: 72". 7/8" heavy wall anodized round aluminum tubing. 3 Bow Bimini Top with Caribbean Blue Performance Poly-Guard Cover. Double-walled main bow for added strength and durability. Overall top height: 54". Fits boat widths: 85" - 90". Overall top length: 72". 3 Bow Bimini Top with Aquamarine Sunbrella Acrylic Cover. Fits boat widths: 73" - 78". Double-walled main bow for added strength and durability. Fits Widths:73" - 78". Overall top height: 54". Overall top length: 72". 4 Bow Bimini Top with Burgundy Sunbrella Acrylic Cover. Fits Widths:96" - 102". Fits boat widths: 96" - 102". Overall top length: 108". 1" heavy wall anodized square aluminum tubing. Square aluminum tubing brace kit for rear supports. 4 Bow Bimini Top with Cadet Gray Sunbrella Acrylic Cover. Fits Widths:96" - 102". Fits boat widths: 96" - 102". Overall top length: 96". 1" heavy wall anodized square aluminum tubing. Square aluminum tubing brace kit for rear supports. 4 Bow Bimini Top with Burgundy Sunbrella Acrylic Cover. Cover has a cutout for a bimini top mounted running light. Fits Widths:96" - 102". Fits boat widths: 96" - 102". Zippered bow sleeves for easy removal of cover to make cleaning simple and efficient. 4 Bow Bimini Top with Forest Green Sunbrella Acrylic Cover. Cover has a cutout for a bimini top mounted running light. Fits Widths:96" - 102". Fits boat widths: 96" - 102". Zippered bow sleeves for easy removal of cover to make cleaning simple and efficient. 3 Bow Bimini Top with Pacific Blue Sunbrella Acrylic Cover. Fits boat widths: 73" - 78". Double-walled main bow for added strength and durability. Fits Widths:73" - 78". Top Height:36" - 46". Overall top length: 72". 4 Bow Bimini Top with Pacific Blue Sunbrella Acrylic Cover. Fits boat widths: 91" - 96". Fits Widths:91" - 96". Overall top length: 120". 1" heavy wall anodized square aluminum tubing. 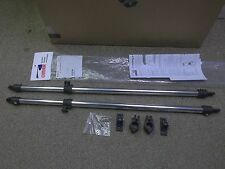 Square aluminum tubing brace kit for front and rear supports. 4 Bow Bimini Top with Captain Navy Sunbrella Acrylic Cover. Fits boat widths: 91" - 96". Fits Widths:91" - 96". Overall top length: 120". 1" heavy wall anodized square aluminum tubing. Square aluminum tubing brace kit for front and rear supports. 4 Bow Bimini Top with Persian Green Sunbrella Acrylic Cover. Fits boat widths: 91" - 96". Fits Widths:91" - 96". Overall top length: 120". 1" heavy wall anodized square aluminum tubing. Square aluminum tubing brace kit for front and rear supports. 4 Bow Bimini Top with Aquamarine Sunbrella Acrylic Cover. Fits boat widths: 91" - 96". Fits Widths:91" - 96". Overall top length: 120". 1" heavy wall anodized square aluminum tubing. Square aluminum tubing brace kit for front and rear supports. 4 Bow Bimini Top with Forest Green Sunbrella Acrylic Cover. Fits boat widths: 91" - 96". Fits Widths:91" - 96". Overall top length: 120". 1" heavy wall anodized square aluminum tubing. Square aluminum tubing brace kit for front and rear supports. 3 Bow Bimini Top with Jet Black Sunbrella Acrylic Cover. Double-walled main bow for added strength and durability. Overall top height: 54". Fits boat widths: 85" - 90". Overall top length: 72". 7/8" heavy wall anodized round aluminum tubing. 4 Bow Bimini Top with Forest Green Sunbrella Acrylic Cover. Fits Widths:96" - 102". Fits boat widths: 96" - 102". Overall top length: 96". 1" heavy wall anodized square aluminum tubing. Square aluminum tubing brace kit for rear supports. 4 Bow Bimini Top with Captain Navy Sunbrella Acrylic Cover. Fits Widths:96" - 102". Fits boat widths: 96" - 102". Overall top length: 96". 1" heavy wall anodized square aluminum tubing. Square aluminum tubing brace kit for rear supports. 4 Bow Bimini Top with Caribbean Blue Performance Poly-Guard Cover. Fits Widths:96" - 102". Fits boat widths: 96" - 102". Overall top length: 96". 1" heavy wall anodized square aluminum tubing. Square aluminum tubing brace kit for rear supports. 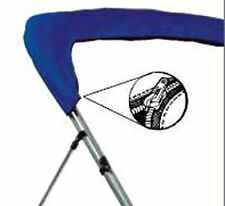 Carver Bimini Top Storage Boot - Cobalt Blue 79"-84"
Carver Bimini Top Storage Boot - Cobalt Blue 73"-78"